Dr. Katie Stembler Bockstedt grew up in Atlanta Georgia and graduated with honors from UC Santa Barbara with a BS in aquatic biology. She earned her DVM from the University of Georgia with a focus in small animal medicine and surgery. Following veterinary school, Dr. Bockstedt worked as a general practitioner in Washington DC; and completed studies at the Chi Institute to become a Certified Veterinary Acupuncturist, as well as a Veterinary Food Therapist and Tui-na practitioner. She went on to open DC's first veterinary clinic specializing in complementary medicine; Wellness Veterinary Care. While growing this succesful and respected practice; she fell in love with her future husband and moved with him to Tucson Arizona. In Tucson, Dr Bockstedt ran the integrative medicine department at the Veterinary Specialty Center of Tucson. After 4 years out west and the birth of her first son; Dr Bockstedt and her family took advantage of an opportunity to move home to Georgia. Soon after the move, her family welcomed a new baby daughter. Dr Bockstedt now lives with her husband, 2 children, and their three legged dog Gator in Atlanta. Dr. Bockstedt is fascinated by the art of medicine. Her time in general practice solidified her belief that there is not one best medicine; and optimal clinical results are often achieved through the integration of the wisdom of multiple medical traditions. She belongs to the American Veterinary Medical Association as well as the American Holistic Veterinary Medical Association. She has frequent public speaking engagements on holistic veterinary medicine, including being a featured speaker at UGA's 2012 veterinary conference. In her free time she enjoys yoga, running, art, and travel. 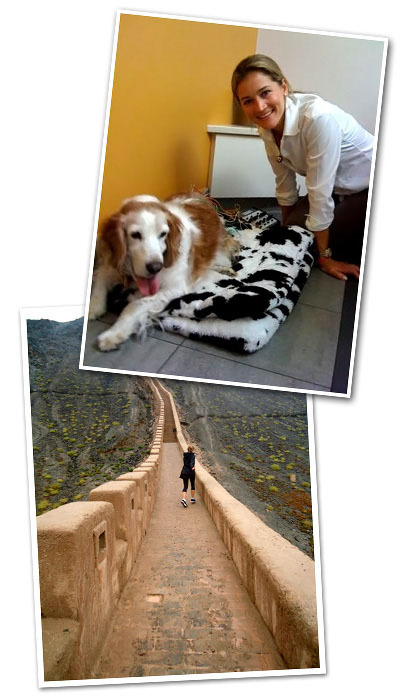 She has travelled to rural Mexico to volunteer her surgical skills with the local canine population as well as Lanzhou, China to attend the First International Conference on Traditional Chinese Veterinary Medicine.